Hitting the trade show circuit can attract new and loyal customers to use your product or service. Because of the unique opportunity for prospects to interact face-to-face with you at trade shows, attendees are also likely to recommend your brand to colleagues, friends, and family members. Getting started with your first convention or trade show can seem a bit overwhelming. You have to figure out a way to effectively represent your business in a sea of like-minded entrepreneurs and stand out in the convention crowd. Knowing a little bit about how to prepare, set up, and interact at trade shows can mean the difference between money wasted and a fruitful event presence. So why invest time and money on promotional products, eye-catching booth setups, and marketing for trade shows and conventions? There are many ways that exhibiting brings value to your business, from helping you get the word out about a new launch to quickly growing your e-mail marketing list. The thing is, there are thousands of different ways you can reach these goals, so why pick the convention option? Let’s look at a few reasons why it’s worth your while to hop on the trade show train! Reach higher-ups—Experts say that trade shows are some of the best ways to reach company influencers. In fact, a recent survey showed that some 84 percent of trade show attendees have the power to make or recommend purchasing decisions. If you’re a B2B business of any sort, then trade shows are some of the best avenues for smart networking. Get more time with prospects—If your current marketing goal is to get the word out about your product or service, or if you run a business that relies on extra face time with customers, then the trade show booth is truly invaluable. The same survey referenced above showed that attendees spend as many as 9.1 hours per trade show visiting exhibits. That means that if the nature of your business dictates a little extra time for pitches, demos, and interfacing, then you’ll do well to invest more of your marketing budget into convention efforts. Get more leads—Who are we kidding? Most of us invest in trade shows to grow our customer base, and the statistics indicate that even a single trade show can help significantly with your prospect-building efforts. In fact, 51 percent of trade show attendees request a meeting with a sales representative after the event. As we'll discuss below, there are some great ways you can leverage your promotional items and display to get even more leads. Inform existing customers—Already a leader in your industry? There’s a good chance that most of the attendees of a niche-specific convention will already know a thing or two about your brand. But that doesn’t mean you should skip the shows this year. Instead, you can use trade shows to introduce new products and technologies while also upgrading current customers to higher-tier products and services. So now that you know why to sign up for your very first trade show, let’s talk a little bit about how to do it. As with almost any business event, step one is to do a little bit of prep. 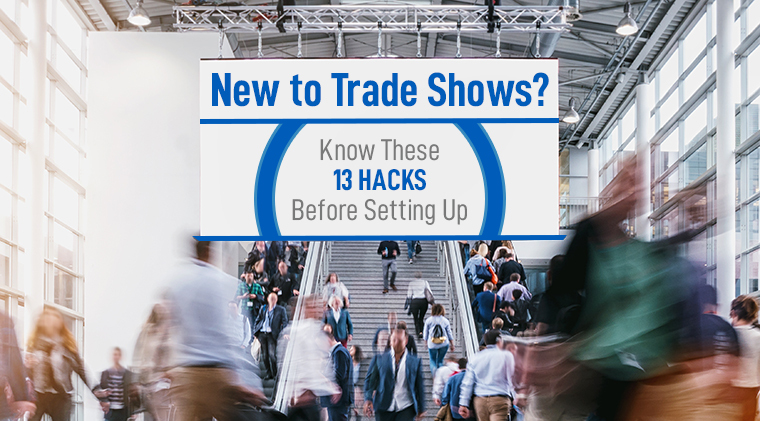 The following trade show hacks will help ensure that you get one-on-one time with the right buyers in the right place with the right strategies for enticing passersby to your booth. Choose your show wisely—Marketing and trade show pros know better than anyone that certain shows tend to be more fruitful than others. It’s absolutely imperative that, for your first show, you do the extra legwork—read reviews, talk to colleagues, and get recommendations from others in the industry—to make sure that a specific show is a good fit. Ask yourself (and others): Will this show connect me with the right buyers? If the answer is yes, there’s a good chance it will be well worth your while. Pick the right swag—While professionals of all sorts hit the convention floor to network and make sensible business decisions, the free promotional gifts never hurt. Be sure that you think hard about your target audience before you choose your promotional goods. Whether it’s custom T-shirts, water bottles, office products, or tech gear, make sure it’s an item that will appeal to your target consumer. Order well in advance to make sure you get what you need when you need it. But if you procrastinate, partner with a company like Pinnacle Promotions that offers free rush production on many promotional products. Get the word out—Don’t forget to let your fans, customers, and potential clients know that you’ll be at any given show. If you do it right, everyone will know you’re there the minute you arrive, but it doesn’t hurt to announce your event presence early on Facebook, Twitter, LinkedIn, and by e-mail. Remember that, as you’re planning to exhibit, show-goers are planning their strategy and figuring out how to maximize their time, so it’s important that you sign up early so you and the show’s marketing team can let show-goers know you’ll be in attendance. Pick a good location—When exhibiting for the first time, you might be forced to go the most affordable possible route but be sure to weigh the ways a little extra spend can get you further. Typically, trade shows charge per square foot—the larger the display, the higher the bill—and for location, with more visible spots costing more. Obviously, the first booth the customers see when they walk in the door offers more value than a small booth tucked in a basement corner. Do your best to pick the best exhibit locale within your budget. One of the most important features of a successful trade show booth is its ability to dazzle and stand out from other exhibitors. If you don’t have a display that commands attention, you can expect show-goers to stroll right past your booth, on to the next! Here are some hacks on how to make your trade show exhibit stand out. Get creative—If coming up with a creative trade show display isn’t at the top of your show prep list, bump it to the top! Impress the crowd with bright, vibrant, and eye-catching elements—lights, colors, and interactive displays are what you need. Ramp up your display with cutting-edge promotional display items that are custom-made to suit your business’s branding. Get started at least eight months in advance to ensure that you’re not scrambling when convention time approaches. Follow the rules—It’s not as fun as coming up with unique trade show exhibits, but it’s equally as important that you know what will or will not fly at your given show. There’s nothing worse than showing up with a dozen electrical components only to find that you only get one outlet to share among multiple booths. Do research on what you can attach to ceilings and floors. Investing in some good residue-free tape is a requisite to ensure that you leave no trace behind when tearing down. 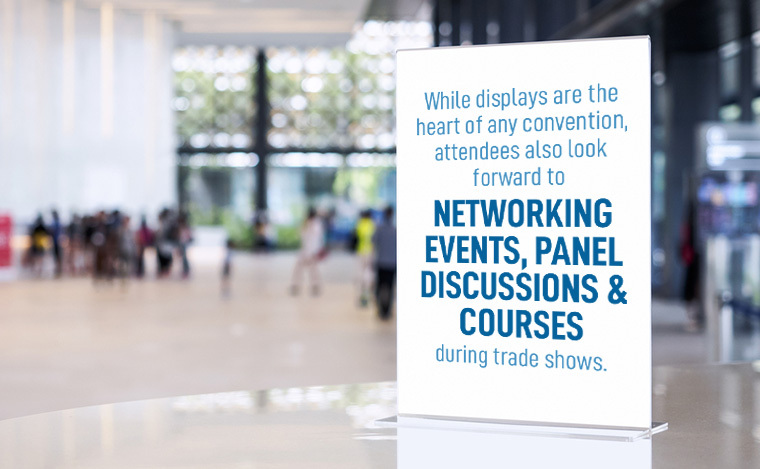 Get connected—Most trade show venues will happily supply your booth with digital services, like fast wired internet, if you need to create connected displays. Any business that needs to showcase a web-based technology should absolutely consider this upgrade—never rely on Wi-Fi when you need to engage a large audience via the web. Slow internet will kill a good demo fast. So, you’ve got a connected, dazzling display…now what? A unique exhibit will no doubt help you draw in curious visitors, but that’s only the first step of successful trade show engagement. The second step is getting prospects to sign up or otherwise engage so that you can convert them to loyal customers. Go for the giveaways—Did we mention the importance of promotional products at trade shows? There are thousands of ways you can use your giveaways to draw in crowds, from offering small, branded pens or rulers to providing larger incentives to get prospects to take action. You can also use raffle drawings to entice people to sign up for your mailing list, watch a demo, or schedule a follow-up. Promote a giveaway for a specific high-value item and hold the drawing on the last day of the event. Leverage incentives—Use your promotional swag to get visitors to engage with your company in different ways. For example, if attendees simply stop by your booth and show some interest, send them home with something small, like a button, lanyard, or keychain. If they sign up for an e-mail list or request a follow-up with a sales rep, give them a higher tier promotional item, like a branded mug or water bottle. You should leave the most desirable giveaways—promotional hoodies, Bluetooth speakers, and ear buds, for example—to the attendees who sign up or order right then and there. Host offshoot events—While displays are the heart of any convention, attendees also look forward to networking events, panel discussions, and courses during trade shows. Sponsor an evening event that’s fun and engaging—think: happy hour with a free drink or two or a networking event that includes games and team-building—to create a little buzz around your business. You might remember the statistic cited above stating that over half of all attendees interact with a sales rep after the trade show has commenced. What does that tell us? Engagement shouldn’t end when the convention does. The final step in your trade show planning journey should be to make a post-show plan that converts new connections to new clients. Get in touch soon—Remember to contact leads quickly—say, within two to three weeks following the convention — so that your company is still fresh in their minds. Strike while the iron is hot, they say! The best way to do this is to have your sales team send out personalized e-mails, so be sure to take notes about different leads during the show so that you can make the connections more personal later down the road. 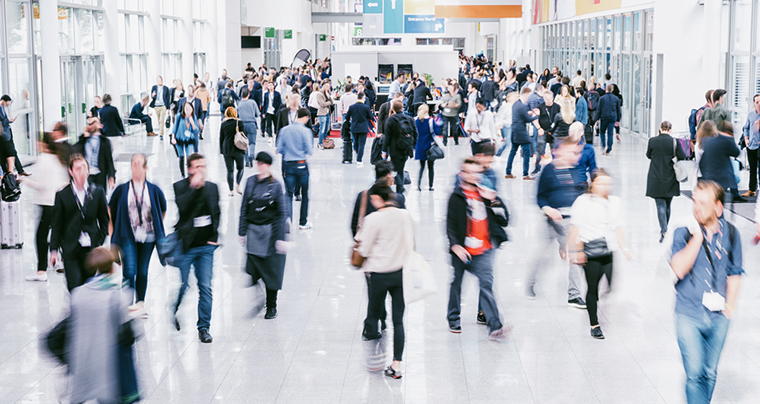 Engage in multiple ways—Be sure that you’re using your new trade show connections to get more followers on social media as well as new e-mail subscribers, and then be sure to engage with them on all platforms following the event. Consider sending out an e-mail blast specifically to those who signed up or engaged during the trade show to thank them for connecting with your brand. Send reminders with swag—For particularly high-value prospects, it can’t hurt to send a couple of useful promotional items to remind them to get in touch with a sales rep. It doesn’t have to be anything too fancy—a pair of branded sunglasses or a logo notebook with a handwritten note is often enough to convert an undecided prospect to a new adopter. Use swag to say thanks for particularly memorable connections and deals. As you can see, first-time trade show exhibitors need to have bold, eye-catching displays and promotional gifts along with a solid strategy to succeed. Before you do anything, make sure that you partner with a good promotional products supplier to help you create cool, unique and memorable branded goods and display items. We’re happy to help you design trade show giveaways that leave lasting impressions and convert event-goers into loyal customers!